I'm pleased to announce the Close Grain School Of Woodworking, opening May 1 in Pepperell, MA for group and private classes evenings and weekends, covering the basics of hand tool woodworking. This is something I've thought about for a couple of years, since I started offering classes through a local parks and recreation department. Scheduling was always the challenge there. I needed to have at least 3 people sign up in order to make them go, and I would get emails from people saying they'd like to do it, but couldn't make this or that night. I thought, wouldn't it be nice to have a simple space with room for a few workbenches, where hand tool classes could be scheduled on-demand? Mark, a friend of mine, recently bought a large 1895 farmhouse in Pepperell to renovate. It includes a barn that at some point was finished inside for use as an antiques shop. When I saw the photos I said that barn sure would make a nice place to teach woodworking classes. Mark liked the idea, so after some discussion, he put me in contact with his insurance agent and the town building inspector for all the proper paperwork. 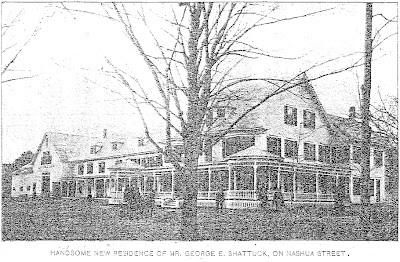 1895 newspaper photo of the farmhouse in Pepperell, MA when it was new. You can just make out the horse and buggy in front. The barn is at the left end. The article accompanying the photo above describes a reception where 200 guests toured the 23 rooms of the newly built house. It's largely unchanged from the photo, except for 117 winters of weathering. Until recently, the house had been divided into apartments. For details, see the school's section on the Hand Tool Instruction page. WOW! Congratulations, you will be a fantastic teacher, judging by your writing and progress documented here! Glad you finally found the space to teach. Great progress! Keep posting, please! I wish you success with your school. If you were a wee bit closer to me I'd sign up for a class. That's great! Congratulations and "break a leg!" with this endeavour! Wow, congratulations! If I'm ever in the area, I promise to pay you a visit.